Although McDonald’s Digital Stamp Card feature launched last fall in British Columbia, Quebec and Halifax, it hadn’t yet made its way to other areas of the country, including Ontario. Now the in-app Digital Coffee Stamp, which allows customers to collect McCafe Rewards digitally on their iPhone, is available across Canada. The digital McCafe rewards card gives you one free medium hot beverage following the purchase of seven other hot drinks. The digital version of the Coffee Stamp Card works precisely like its physical counterpart, as you may have already assumed. It’s unclear when or if this feature is set to make its way to the Android McDonald’s app. Back in October of 2017, McDonald’s released mobile ordering in select Canadian cities before more widely rolling out the feature across the country a few months later. The McDonald’s app is available in the iOS App Store and the Android Google Play Store. 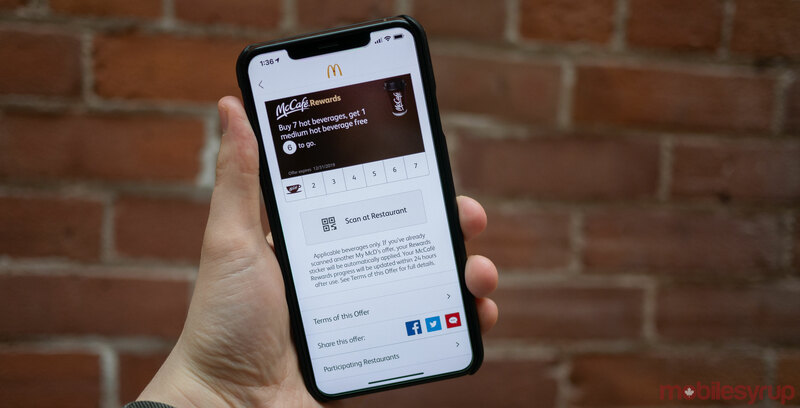 Update 01/28/2019: McDonald’s Canada has reached out to MobileSyrup to confirm that customers can “double dip and collect both digital stickers and on-cup stickers” in order to earn even more free beverages.